January | 2013 | ride. travel. live. Just a quickie post for the new year, I’m hitting the road again shortly. This is architect H.H. 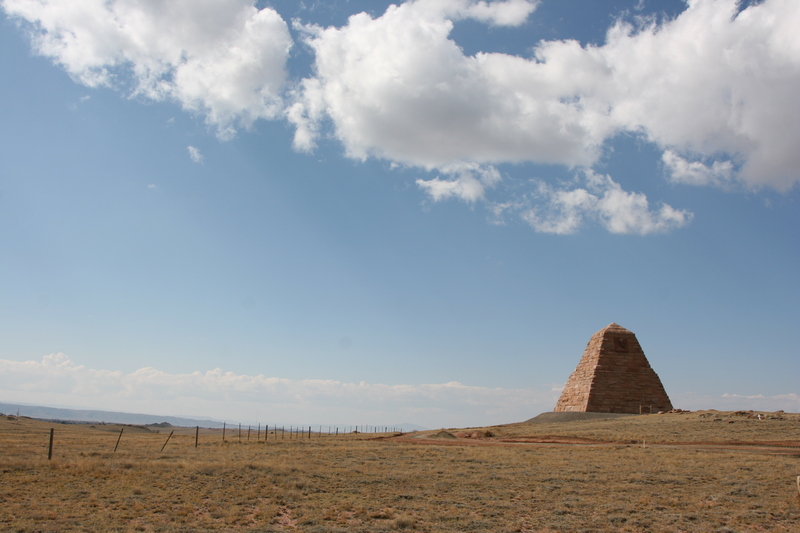 Richardson’s lone structure in the American West, located midway between Cheyenne and Laramie, Wyoming. 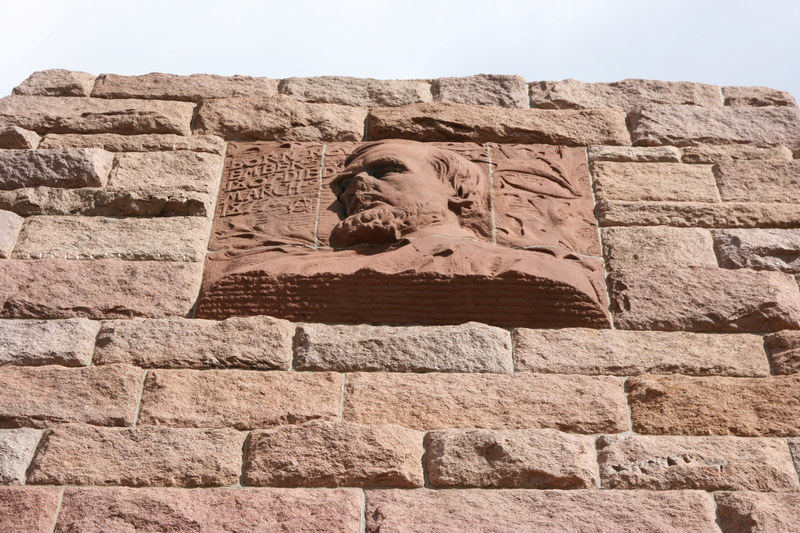 Completed in 1882, it features Richardson’s rugged stonework and bas-reliefs of the Ames brothers of Union Pacific Railroad fame, done by the sculptor Augustus Saint-Gaudens. It’s an isolated structure, visible for miles around, on a treeless, windswept plateau near the highest elevation point of the railroad, 8250 ft (2515 m), and within earshot of I-80. Of course it doesn’t have the detail or planning of his buildings, but is a rare collaboration between America’s greatest 19th century architect and greatest 19th century sculptor. Ames Monument, about as close to the sky as you can get. John and Washington Roebling, the father-son engineering duo, and best known for their Brooklyn Bridge in New York, finished in 1883. They also designed a number of bridges across the nation, here are a few of them. 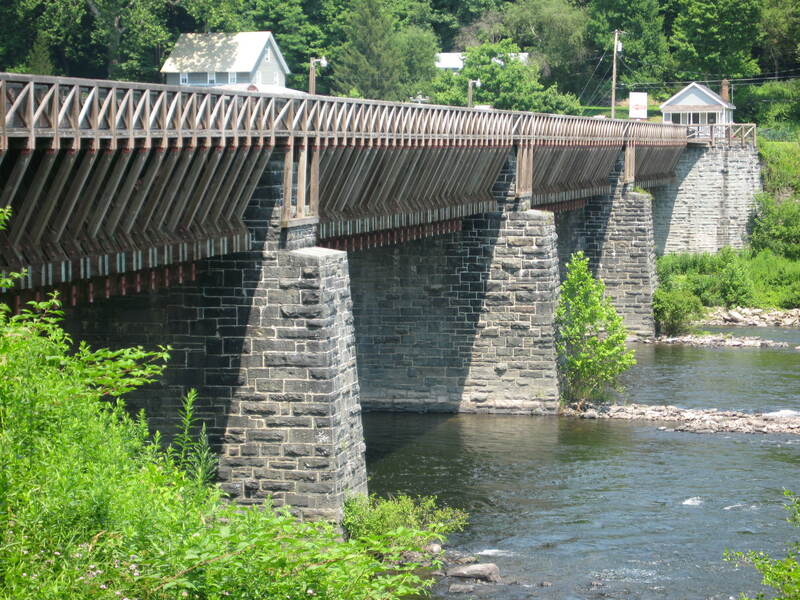 Starting about 80 miles from New York, across a peaceful Delaware River, is the Delaware Aqueduct, also known as the Roebling Bridge (1849), which used to carry river traffic to relieve traffic on a crowded, busy river. Yes, it’s a suspension bridge, with the tops of the main cable visible at the ends of the bridge. While this once carried water and barges, it’s now been converted into a one-lane bridge. What’s seen today is mostly a remodeling job done by the National Park Service to restore it to its near-original appearance (minus the water). The Wheeling Suspension Bridge in Wheeling, WV, was the longest span in the world when completed in 1849, linking Wheeling Island with downtown Wheeling. 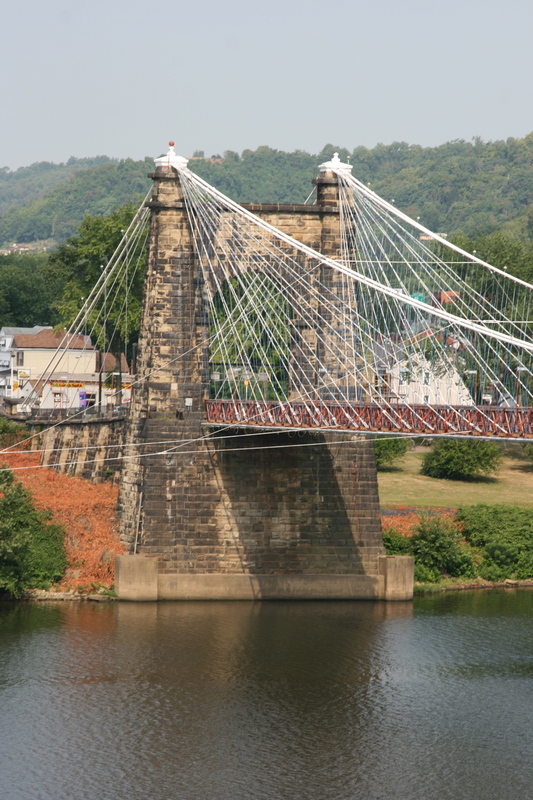 While it has been rebuilt and strengthened over various periods, this is the oldest suspension bridge still in use in the U.S., although only able to handle a limited number of cars on the deck. 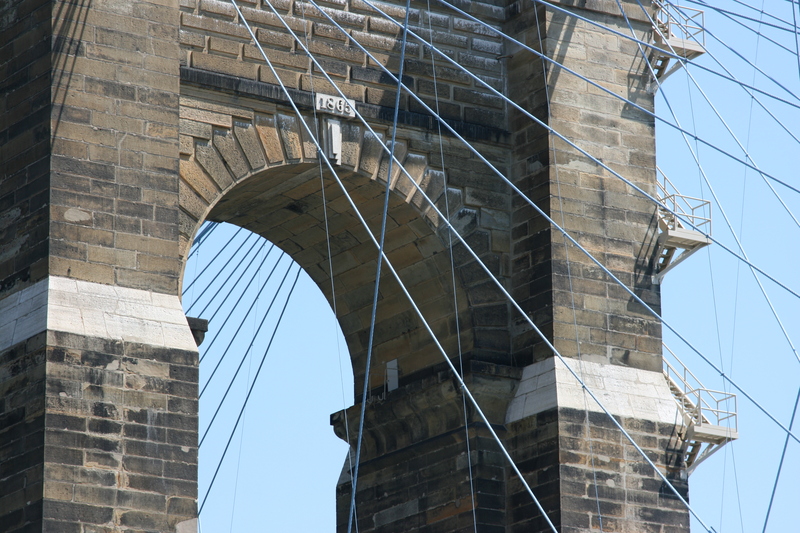 The original structure was not by Roebling, he had proposed a more conservative structure, but ultimately the design went to Charles Ellet, Jr., who aimed big and designed a large, 1000 foot+ span. After the deck was destroyed during a windstorm in 1854, the bridge was rebuilt. The original deck apparently collapsed under similar circumstances as the original Tacoma Narrows Bridge in 1940, attributed to aerostatic flutter that led to the bridge vibrating at its natural resonance frequency. Washington Roebling designed the cables during a remodeling / reconstruction in 1870, and that’s more or less how the bridge has looked since then. The cable design should be familiar to anyone who’s seen a picture of the Brooklyn Bridge. This one is on a smaller scale, but still has an impressive 1010 foot center span, and a nifty asymmetry. The bridge deck level slopes downward in the center towards the level of the island. It’s a worthy part of the National Road (US 40), and one of America’s great unknown structures. 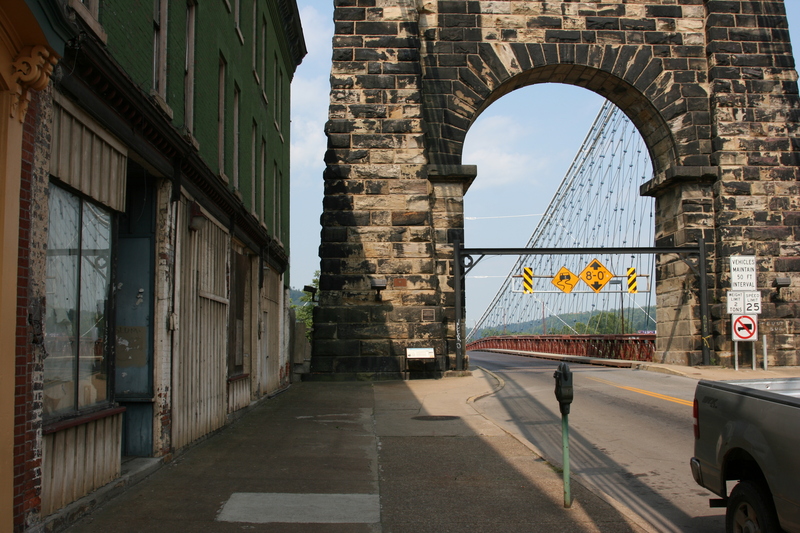 The city of Wheeling is a shadow of its former self, but yet might come back. 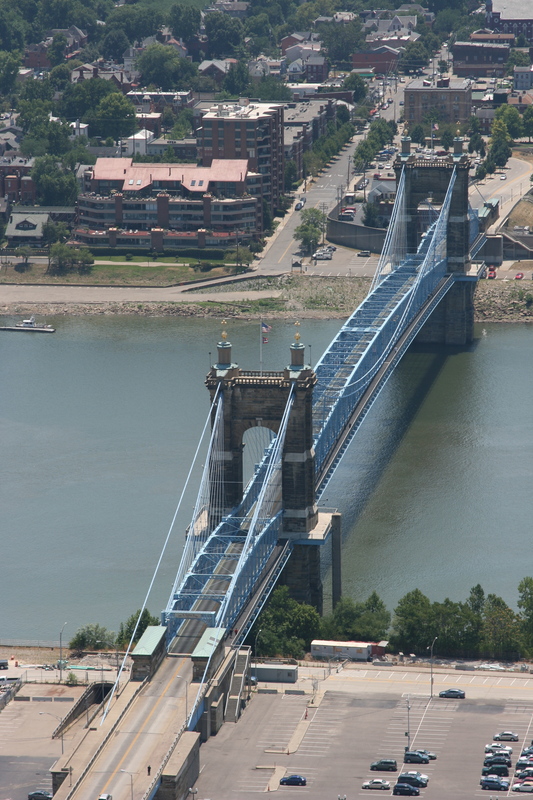 Further downstream on the Ohio River is the Roebling Bridge that links Cincinnati, Ohio, with Covington, Kentucky, this one being the direct ancestor of the Brooklyn Bridge. Finished in 1866, it lacks the Gothic features of the Brooklyn Bridge, but has the signature cable pattern and rugged towers. This one out-spanned the Wheeling Bridge by a few feet, with a center span of 1057 feet. Depending on which way you look, the view of the bridge and the Cincinnati skyline today is little changed from 80 years ago. It was also notable that the construction of the span continued during the Civil War, for military purposes, but could be interpreted as a political move to connect a northern state with a state that did not formally secede from the Union, but had mixed views on slavery, balanced with practical concerns about trade and transportation.